If you are a blogger and you have content that I am interested in, I am going to visit your site to read that content. I know before I get there that you are going to have some ads, maybe some affiliate links, etc., that is how you make a living. Yes, I get that. However, if I get there and you have banner ads, pop up ads, sidebar ads and ads in between every paragraph of copy, I’m leaving. I don’t want to show up to read a 700 word blog post on cleaning or repairing my Keurig and have to wade through 12 different ads. I know there is a guru out there somewhere that is telling you that you need to add a popup to really get the reader’s attention, so you can grow your list. You’ve spent all this time creating a workbook or checklist that you really want to give them for free, so that sounds good right? I say Nay Nay! There is nothing wrong with putting an opt-in within a blog post. If I like what I am reading and getting value from that, then I want to sign up. Heck yeah, I’m all in. If I go to your website to read a post and before I can get 5 words in there is a huge pop up covering the screen, I’m leaving. I don’t care how good your content is and I’m not sorry. Put that opt-in in the middle or end of your blog post or even in a sidebar. I can deal with that, I know it’s there if I want it. Maybe I’ve seen you around hanging out in the same Facebook groups. Then I think, ‘you know they always give good advice, I wonder what he/she does’? So I click on your profile to find your website. I get there and it looks nice, the colors don’t clash, and there aren’t any popups to drive me away. But I can’t find you…..I mean YOU. I have to really dig to see what you do and I’m a little confused. But even worse, there’s nothing there to tell me who you are. Do you like animals? Have a sense of humor? Know all the words to my favorite songs? You need to inject some personality into your website. This is the only way to start building a relationship with the people that are showing up on your site. I want to know you, like you, and trust you before I hand you my money and start working with you. I was in the corporate world for a long long time. It’s hard sometimes for me to be casual in my communications; i.e., emails, blog posts, FB chats. I get a lot of grief from a good friend of mine for this very reason. And I get it. I am ok with others that are laid back, I don’t care if you swear, drink wine at 2 in the afternoon, or work in your pajamas (like for days). When your website has a ton of mistakes, I can’t take you seriously. I mean everyone has typos and slips, we can’t catch them all. I know I’ve read back through my own stuff and found mistakes and was horrified. A typo, messed up spacing or a missing or broken link is not a deal breaker for me. But when I find multiple mistakes on every page of your website, then I feel like you are not the type of person that is big on attention to detail. So, no offense, I still love your PJs but I’m most likely not working with you. So do us both a favor, after you read and read again all your content, have someone that you trust read through it for you too. When we read our own junk, we often see what should be there and it can be really easy to miss those mistakes. Keep your website updated! If you’ve been using the same website for the last 5 years, it is most likely time for an update. Of course you always want your content up-to-date, but you should also pay attention to your design. Trying to stand out these days in a competitive online world can be tough. Make sure you are doing everything you can to keep people interested and learning more about you. Your website is a great place to start! Take a look at it today, does it still represent who you were in business a couple of years ago? What type of journey do your potential clients have when they enter your site? Do you have a clear call to action on each page so they know the next steps? Do you have too many distractions? Is it confusing? So how did you do? 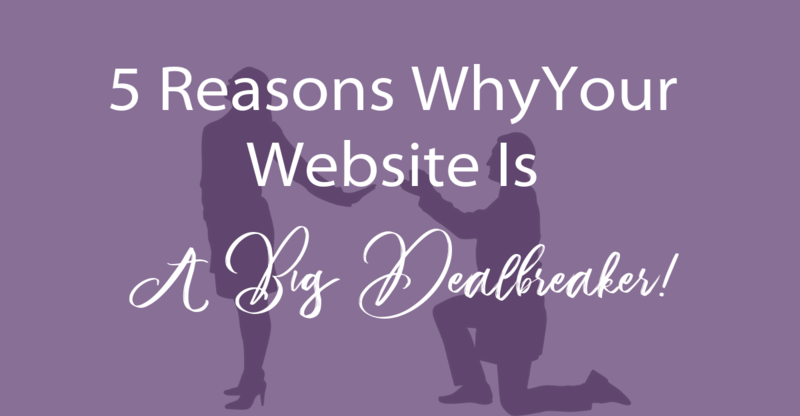 Is your website a dealbreaker? Maybe it’s time to do a little cleanup? Is it time for a redesign or a whole new website? I have two options to help you get there (if you need it). If you want help with this you can connect with me here and we can talk about what you have, what you want, and what you need! Maybe you are the DIY type but need a little more knowledge to do ‘all the things’ to your WordPress site? You should check out Julia Taylor’s WP Rockstar course – this course will teach you some WP basics, coding tricks, etc. If you are looking for a little more, her Zero to WP Hero course teaches you how to build from the ground up. This course also includes the Genesis Framework and a Child Theme ($129 value) free with course purchase! You can find her courses here! This is seriously one of the best courses I have ever taken. It is so full of content and extras it should be 3 times this amount (and probably will be soon). Julia knows her stuff! 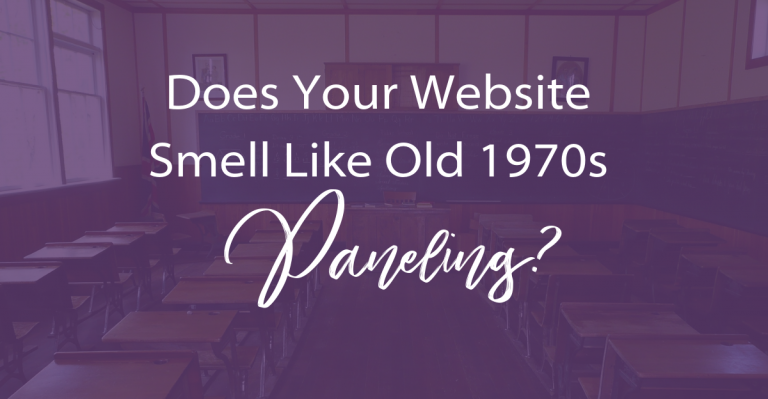 Next PostDoes Your Website Smell Like Old 1970s Paneling? So agree that some websites are still “stuck” in 1999 and definitely in 2019 (20 YEARS later) should really be allowed to evolve in design! I am so glad I read this. I cannot handle pop ups they drive me batty. I do question my plugins. Tha is for sharing. I am currently upgrading my site as you say it reminds me of 1999. You can sign my name to each one of these annoyances!